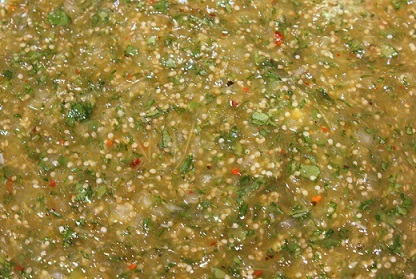 The Mexican Salsa Verde Recipe includes tomatillos, chilies, garlic, onion, and salt. 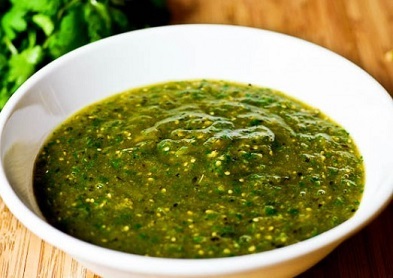 It is also known as green sauce and is used in making many Mexican dishes as well as a condiment. This salsa is brightly colored and fresh. It is fantastic over broiled salmon or scrambled eggs, with fried chicken, pan fried pork chops, and pan fried potatoes, eggs and white fish. Serve the salsa with tacos or burritos or as a dip with tortilla chips. This is one of my favorite salsas. Tomatillos are small green fruits surrounded with a papery husk and they are a Mexican relative of a tomato. Tomatillos are also what help give the salsa its green color, along with the chile peppers and cilantro. The tomatillos also give the salsa verde a tangy, zesty flavor with the underlying tastes of the chiles, cilantro, garlic and onions. Here's a quick and easy Salsa Verde you'll love, but don't be afraid to experiment with this salsa. You can add more "heat" by including some of the chili pepper seeds. Try different chilies when you get a chance or even a different combination of chilies. This is a salsa to make your own. Preparation time: 25-30 minutes. Makes about 2 cups. This green salsa recipe can be made a day ahead of time. It can also be served warm if you prefer. 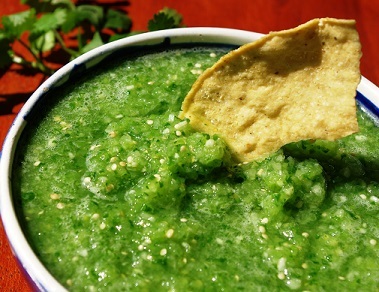 Enjoy your Salsa Verde and the company of those you share it with! Did you know? The basic salsa verde recipe is probably from the Near East and, as such, is probably at least 2,000 years old.